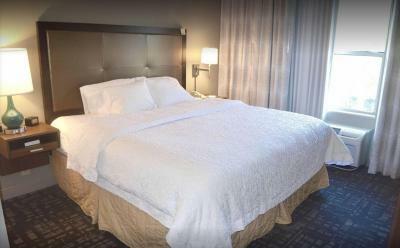 Lock in a great price for Hampton Inn El Centro – rated 9.3 by recent guests! The hotel was in an ideal location for the activities we planned. It felt calm and classy. The breakfast was abundant and fresh, and the tables big and roomy. The pool and gym were good sized and clean. The staff at the desk were friendly and recognized us as we came and went, even on the first day. Very happy. It was very, very quiet, and the curtains blacked out well. This made relaxing and cozy. The matress was comfortable, and so we're the pillows. The esthetics are nice, the color scheme and inside really nice. I liked that it was clean and that the breakfast had a great selection. Very nice location many places to eat and shop within walking distance. I liked everything. Everyone was amazing, friendly, helpful and knowledgeable. Basically over the top service! Check in was fast and efficient. My paperwork and room key were waiting for me. All I did was show my ID and sign the my name and I was off to my room. The young lady at the desk was welcoming and helpful. Right off the freeway and next to a mall. Young ladies at the front desk were Awesome! Nice clean facility, friendly service and a good Breakfast for the little ones! Hampton Inn El Centro This rating is a reflection of how the property compares to the industry standard when it comes to price, facilities and services available. It's based on a self-evaluation by the property. Use this rating to help choose your stay! One of our best sellers in El Centro! Hampton Inn El Centro is offering accommodations in El Centro. This 3-star hotel offers a 24-hour front desk. Free WiFi is at guests' disposal. A business center is at guests' disposal at the hotel. Mexicali is 14 miles from Hampton Inn El Centro. Imperial County Airport is 9 miles away. This property also has one of the top-rated locations in El Centro! Guests are happier about it compared to other properties in the area. This property is also rated for the best value in El Centro! Guests are getting more for their money when compared to other properties in this city. When would you like to stay at Hampton Inn El Centro? House Rules Hampton Inn El Centro takes special requests – add in the next step! Hampton Inn El Centro accepts these cards and reserves the right to temporarily hold an amount prior to arrival. When I (mistakenly) thought I lost something important to me in the hotel, Alexis was extremely kind and patient. I really appreciated her genuine effort to find my lost item, instead of having an attitude of "there is nothing I can do." She is a great person to have interacting with customers. I also appreciated the other woman on staff at the time, but unfortunately did not get her name. The linen did not smell clean, on a previous stay the linen smelled dusty. Luckily I had my own blankets. There indoor pool, had freezing water temp. This made the pool unenjoyable, and the facility seems ok with that situation, like one less thing to clean. I just don't get a welcoming vibe. Comfortable, great price, great location.. This time coffee service was cold at the lobby, the room air extractor was not working.